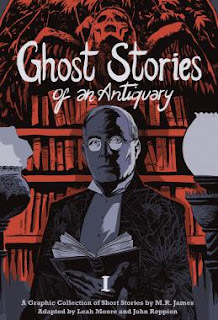 Ghost Stories Of An Antiquary, Volume 1 collects graphic retellings of four spine-chilling tales by the renowned medievalist and writer. At once true to their source and powerfully reimagined for a visual medium, Leah Moore and John Reppion's subtly crafted adaptations give anew lease of life to these classic stories of vanishing children, spectral works of art and vengeance from beyond the grave. SelfMadeHero has published a wonderfully illustrated graphic novel that brings to life the haunting words of M.R. James. The stories are some of his fans favourites and they include Canon Alberic's Scrap-book, Last Hearts, The Mezzotint, and The Ash-tree. The great thing is to add freshness to the whole novel is that each story is drawn by a different artist. As this is the first volume we can hope that they will do further volumes. Would highly recommend anyone who is a fan of classic horror check this out, and if you can read it by candlelight on a stormy cold night you will really embrace the writings of M.R. James. If you hear any noises in the night, in the dark, stay within your confines and just hope that its the wind. Ghost Stories Of An Antiquary: Volume 1 is published by SelfMadeHero and is out now. (64pp, colour, paperback, rrp £9.99).